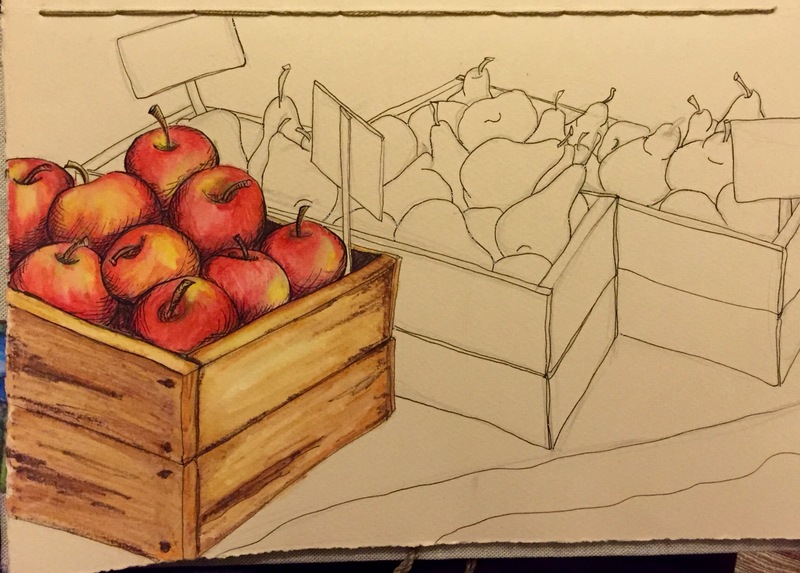 I am still working on images from the Farmer’s Markets I visited a couple of weeks ago. I was not only captivated by the wonderful fresh produce, I liked the various ways that stall holder’s displayed their wares. This lovely old bucket was just gorgeous and very aptly labelled. The colour went so well with the vibrant snow peas. 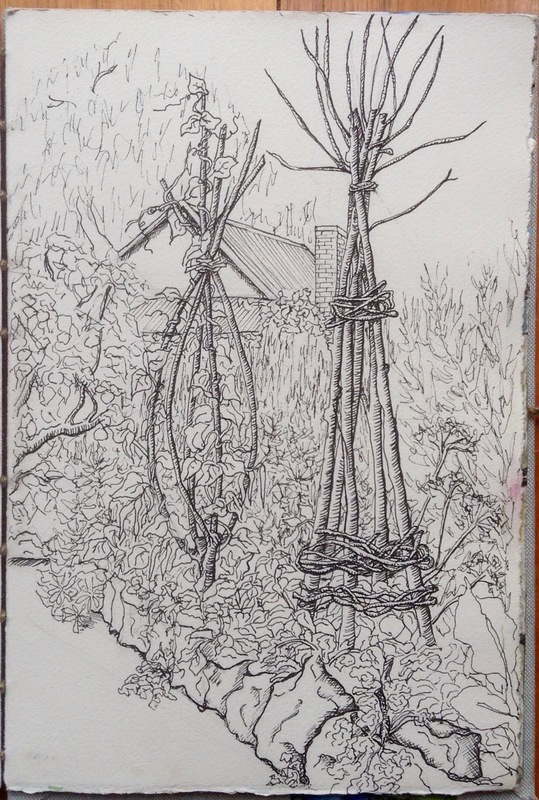 I have an unfinished drawing of Tute’s vegetable garden in Castlemaine that I visited earlier, (see here) which I thought I would share with you. It is still only a line drawing as I haven’t decided how to colour it, I have not had the results I wanted from water-colour (more my lack of skill rather then the medium), so not sure if I will return to colour pencils or water-colour pencils. I really enjoy water-colour pencils and use them I lot in my sketch book, but I am always mindful of the fact that they are not very colour fast. It is disappointing that so many of our art supplies are still not colourfast in this day and age. I wish manufacturers would be mindful of this point when they develop new products. I have had a lousy week with flu and now Autumn seems to have run away already and we have moved into our cold, grey winter. I have been trying to do some drawing for a friend of mine and they are just not working out. Well that is my moan, I will go back to working on the collaboration books, they always make me smile and snuggle down onto the coach with the heater on. I am currently involved in two different collaborations, which can get confusing for all of us. 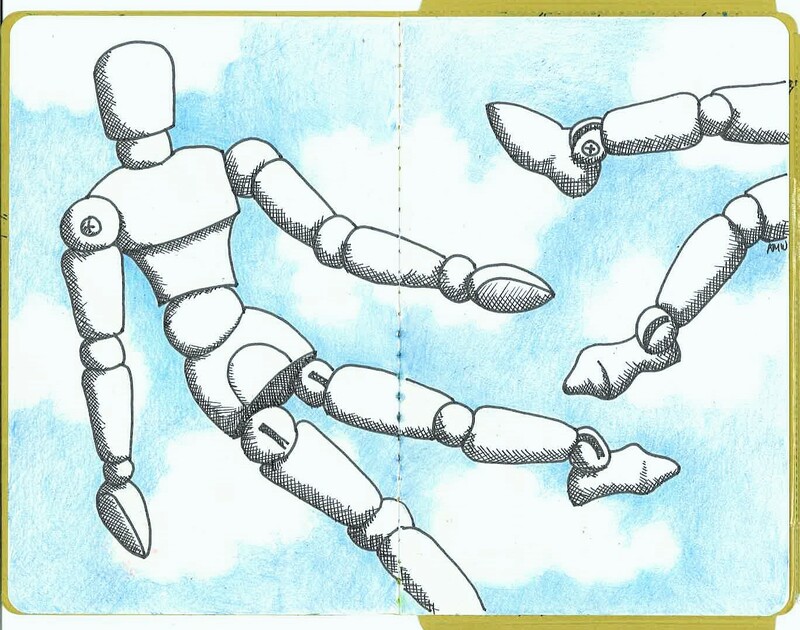 This post is about the first, is using lovely little A5 booklets that Anna Warren found. There are three of us involved Anna Warren, Kylie Fogarty and myself. I have already worked in one book with a seaside theme (see here) and this is my second which has the theme ‘No fear of flying’. Anna’s post on her drawings in this book are here. I loved the theme, but was really stumped with what to do with it. I went through all the thoughts about flying and then I thought who are the best flyers in the natural world. (Not being much of a people drawer I usually go to the natural world for my artistic inspiration). 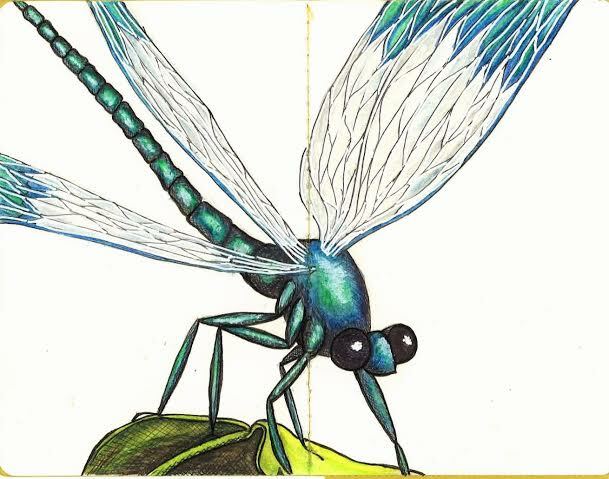 For me, dragonflies are the best flyers, having the two sets of wings that can move independently they can hover, twist and do the most amazing aerial feats. They certainly have no fear of flying and I reckon the look in their eyes shows little fear of anything. For the front and back covers I choose images of unconventional flying. 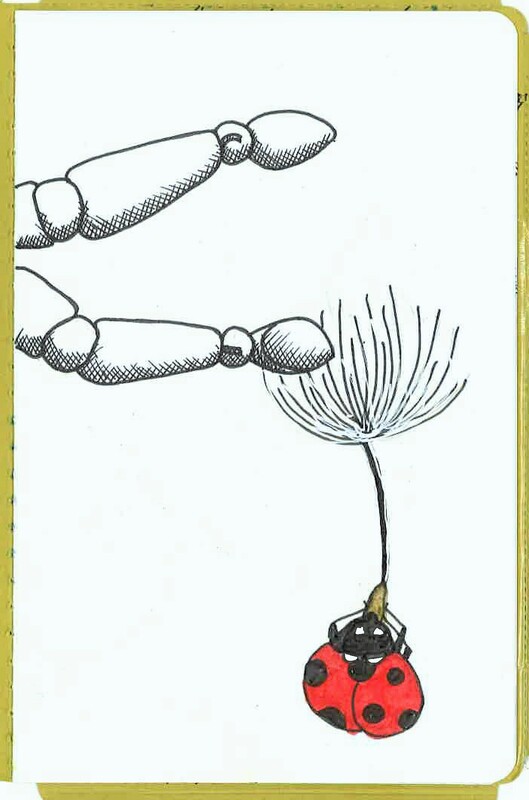 The front cover is of a ladybird hitching a ride on some dandelion fluff and I just loved this little image, it has a real sense of adventure to it. 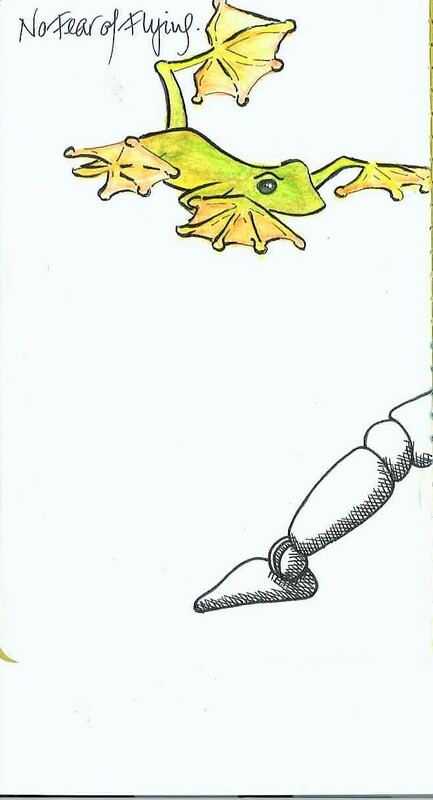 On the last page I drew a flying frog, it is a representative for all those creatures who really have no business in flying (not having wings as such), but have managed to do it anyway. These flying frogs are the weirdest in that strange and intrepid group. These collaborations are really a great deal of fun and tremendously rewarding, but oh my are they intimidating. All of us have experience at doing art and at being artist, but having to draw in someone else’s book brings all my early fears back again. What if I do this wrong, is my work good enough, their work is so much better than mine and what the hell am I going to draw! But again the rewards of doing these collaborations and the joy of watching the amazing work the others do and to see how they respond to our themes outweighs the trepidation of setting pen to the their books. Also the response from our readers has been fabulous and everyone is so supportive and interested in what we are doing. I hope I have done this little book justice and have not sent the theme in a wrong direction. 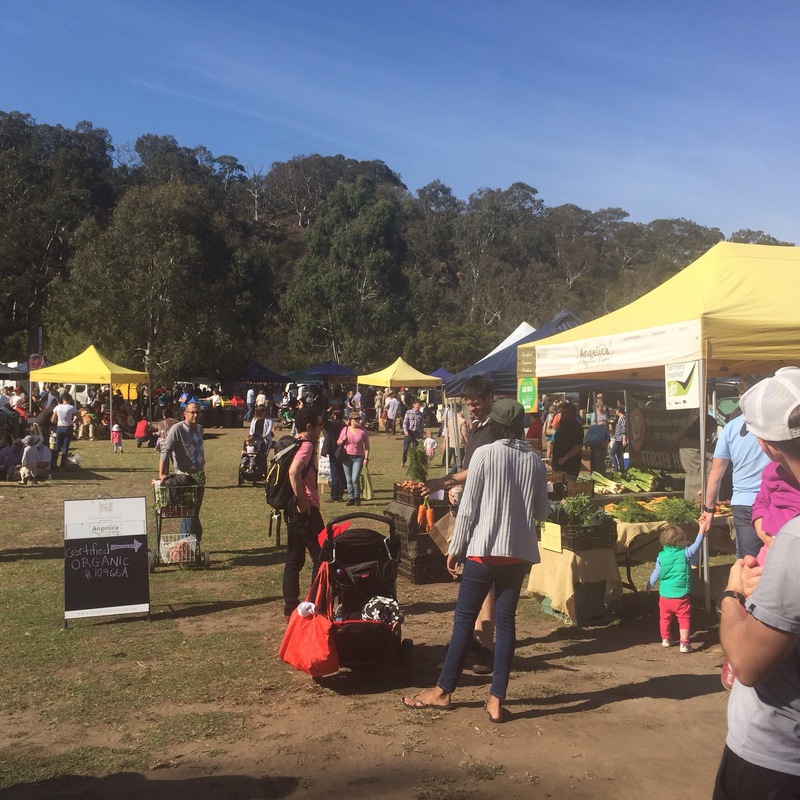 It has been perfect autumn weather the last couple of weekends and the farmer’s markets are just bursting with produce. I have been to two, one in Castlemaine and the other in Melbourne. I adore these markets and always come away with too much, but the produce is soo tempting. 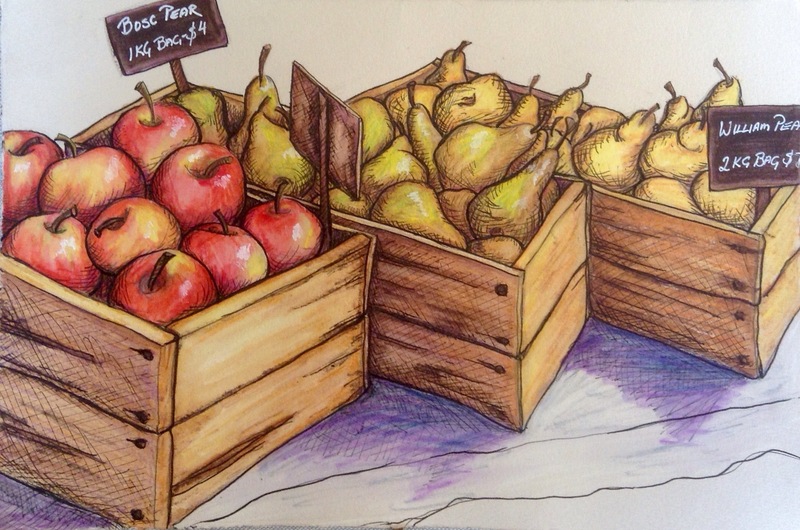 This sketch is of an organic fruit stall in the Castlemaine market, don’t you just love the colours of the apples and pears. I have tried to capture the crispy freshness of it all, displayed so beautifully in the old fruit boxes. The styling of the market stalls has come a long way. Here is a work in progress of the sketch, I took the photo in the evening so I apologies for the quality of the colour, but it gives you the idea. I have used my new Ahab fountain pen from Noodlers with this. It has a flexible nib which allows you to vary the width of the line depending on how hard you press. I am starting to get used to it and it worked well with this drawing and I got some nice line variation in the outline of the fruit. Fruit Harvest Work in progress. 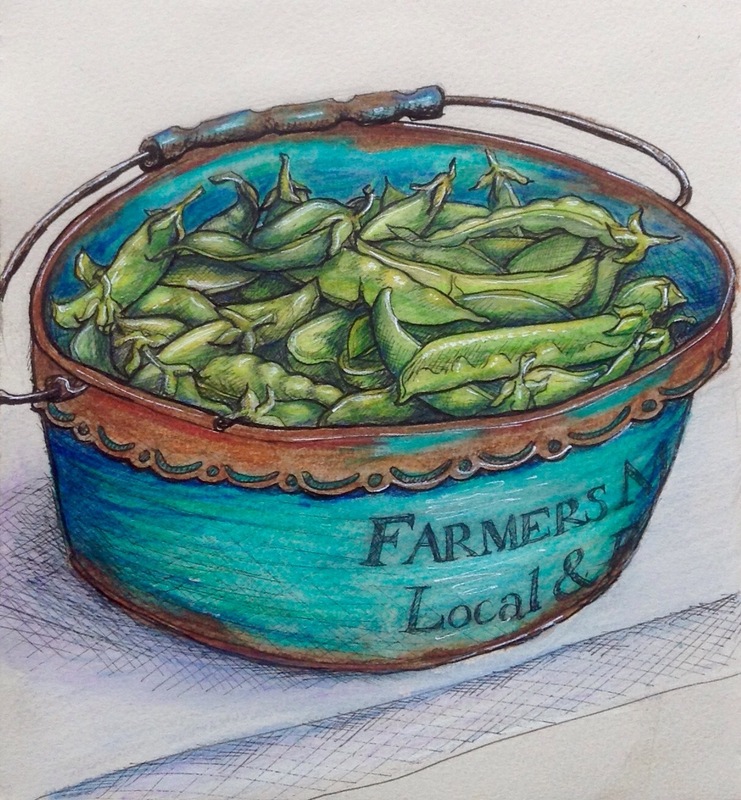 I am tempted to do some larger colour pencil drawings of all this produce, see how much time/energy I have. 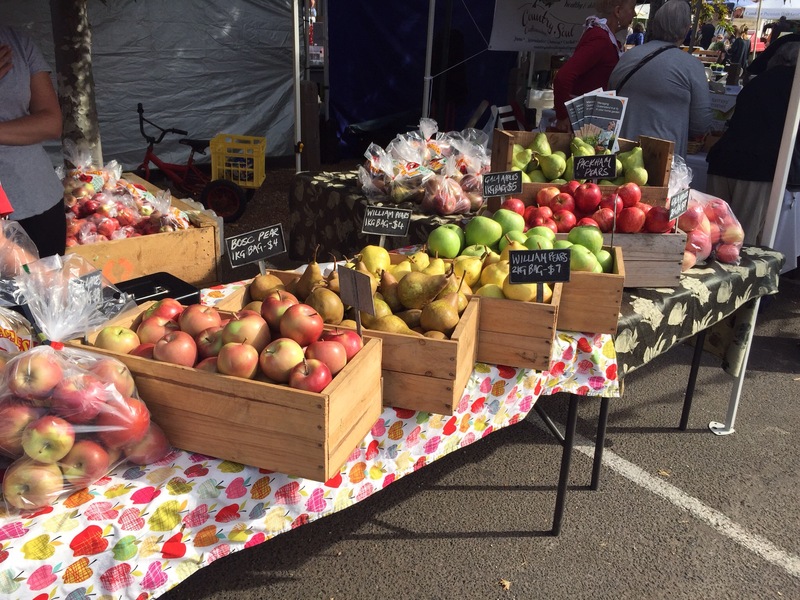 This weekend I am in Melbourne and as I was still excited by markets, went to the Collingwood Children’s Farm Market. This is right next to the Abbotsford Convent where I did a sketch of the market there see here. It is a working farm only a couple of kilometers from the city centre beside the river and it is a place where you can children to see where their food comes from. There are all the usual farm animals and great fruit and vege gardens. A magical place. The farmers market is big and busy, but when you walk around you would not believe you are in the city. I took lots of photos so there will be some more drawings coming up. Well my blog has a new name, Karen Bailey Studio which is also my domain name. I like occasionalartist, but as I draw nearly every day now, I thought it was time to move on. I am gradually learning what to do to set up this new web site, but it will be a slow progress. Any link to occasional artist will be kept and redirected to this new domain. I tried so many names but I thought Karen Bailey Studio gave me plenty of breadth to do different things, while still linking firmly to me. 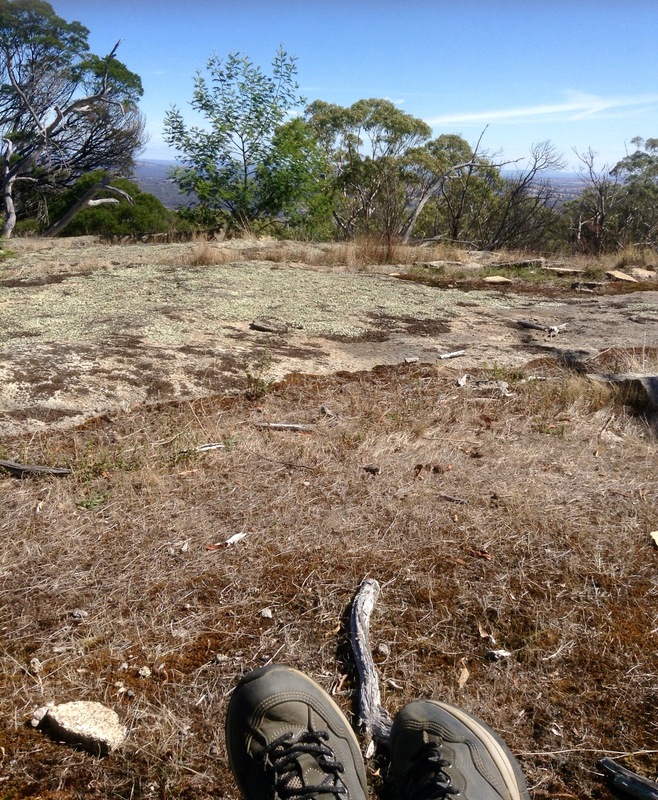 Last weekend I went for a walk along the spine of Mt Alexander near Castlemaine. It is a favourite place of mine to walk. 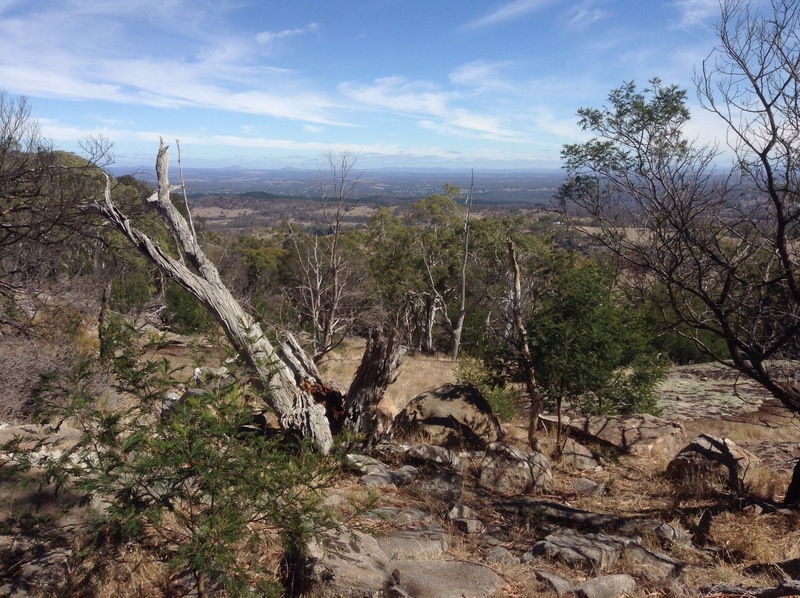 The mountain (of very modest proportions, it the flat plains of central Victoria a mountain does not have to be very high to get the name, only 774 m) it is set in amongst iron bark bush land and is studded with lovely grey granite boulders. You get lovely views on either side looking east and west as the mountain is very long and skinny. It was a perfect autumn day clear, sunny and still, just perfect for a sketchy walk. 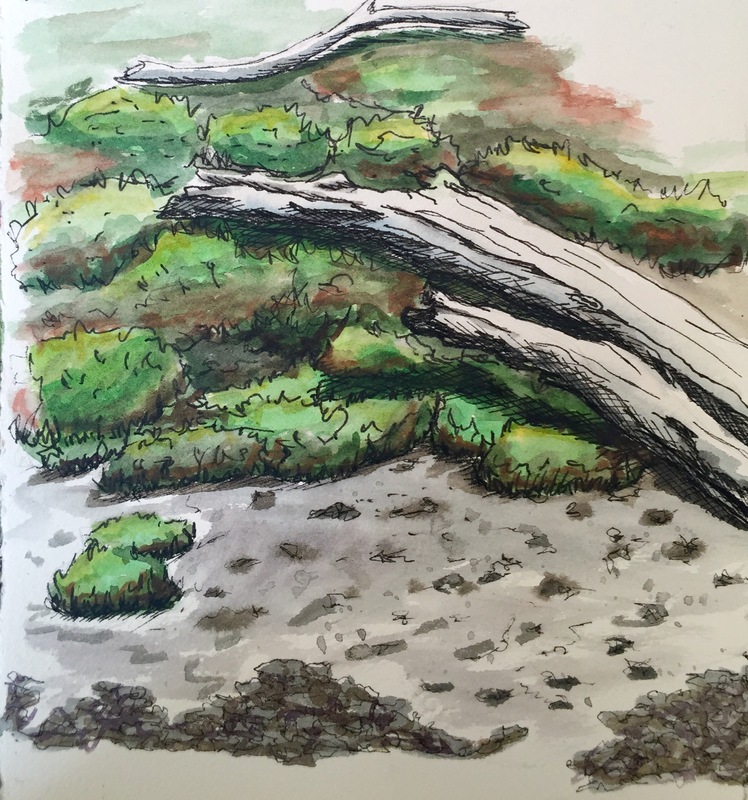 My first drawing was of some lichen and moss on the exposed granite surface. I am having a bit of fascination with lichens at the moment and here was an opportunity to draw them in situ. 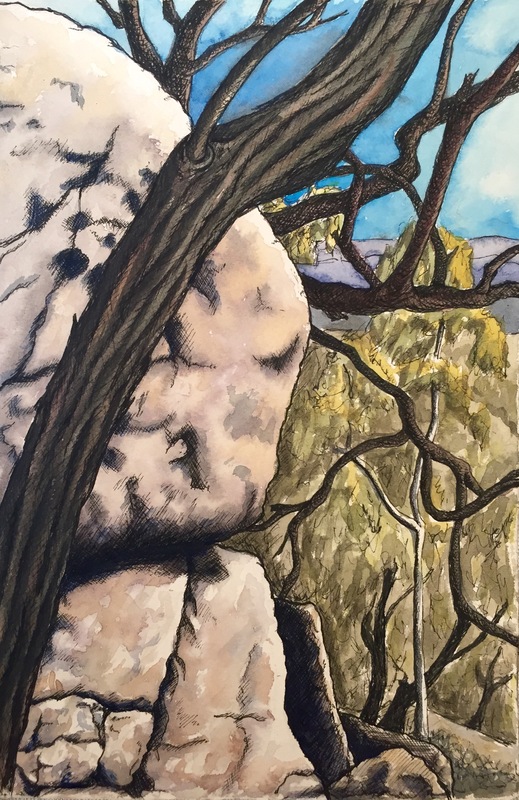 Walking a little way along I stopped at dog rocks, and chatted with some lovely people learning to abseil, then did another sketch of one of the many upstanding rocks in this group. I never did find the rock that was supposed to look like a dog, but I brought my own along anyway. You may notice a few changes to my blog in the coming weeks as I am starting to change this site into a website and make changes to allow the purchase of my art through the site. I hope it all goes smoothly and I don’t mess up my blog. Fingers crossed and I hope for the best.